HP 51629A (HP 29) Black Premium Quality Remanufactured Inkjet Cartridge designed to work in the DeskJet 600/ 660/ 670/ 672/ 680c/ 682c/ 690c/ 692c/ 693c/ 694c/ 695c/ 695cci/ 697c, DeskWriter 600/ 660/ 672/ 680/ 682/ 690c/ 693/ 694, Fax 910/ 920, OfficeJet 380/ 50. Also fits NCR, Digital Check, Apple, Pitney Bowes, and Sony printers. The use of compatible supplies does not void your printer warranty. 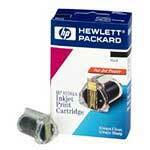 Genuine HP 51604A Black inkjet printer cartridge for the HP QuietJet/ QuietJet II, ThinkJet. Also fits some NCR, Digital Check, Panini, and Diconix printers. Genuine HP 51629A (HP 29) Black Inkjet Print Cartridge fits the HP DeskJet 600/ 660/ 670/ 672/ 680/ 682/ 690/ 692/ 693/ 694/ 695/ 697, DeskWriter 600/ 660/ 672/ 680/ 682/ 690/ 693/ 694, Fax 910/ 920, OfficeJet 380/ 500/ 520/ 570/ 580/ 590/ 600/ 610/ 630/ 635/ 700/ 706/ 710/ 720, PSC 370/ 380 Series printers. Also fits some Apple, Digital Check, Pitney Bowes, NCR and Sony printers. 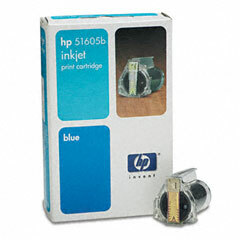 Genuine HP 51605B Blue inkjet printer cartridge for the HP QuietJet/ QuietJet II, ThinkJet. Also fits some NCR, Digital Check, Panini, and Diconix printers. Genuine HP 51605R Red printer ink cartridge designed for the HP ThinkJet/ QuietJet/ QuietJet Plus, NCR 7728, NCR TS 200/ 210/ 220/ 300/ 400es, Panini S1, Digital Check TellerScan 200/ 350ebs ink printers. 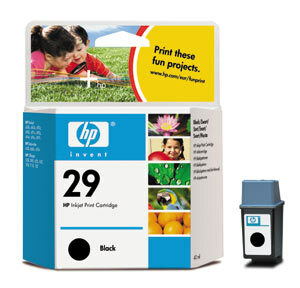 Genuine Hewlett Packard HP C6602A Black inkjet cartridge designed for the Hewlett Packard HP Addmaster IJ 6000 point-of-sale inkjet printers. Also fits Digital Check, Ithaca Per., Panini, and NCR POS printers.